Oologah United Methodist Church was honored recently with the "Spirit of Will Rogers Award" for sharing its contemporary worship space with several community groups after the city demolished its community center to build a new one. The church is welcoming Boy Scouts, Oologah Senior Citizens, and other groups while the work is being done. From left are Chamber of Commerce President Carolyn Estes, Pastor Jennifer Long, and Lay Leader Justin Wine at the Chamber banquet. 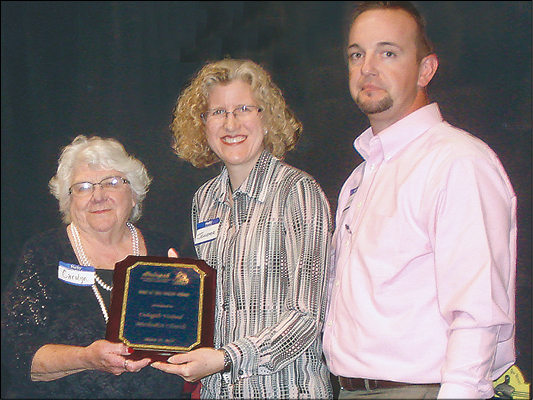 The presentation marked the first time the award went to an organization rather than an individual, according to the Oologah Lake Leader. The church also coordinates a food bank, organizes a Food for Kids drive, holds a Thanksgiving basket giveaway, and hosts a monthly drop-off site for the Northeast Oklahoma Food Bank.